All cannabis plants start as seeds, and they all require water to germinate properly. Each seed contains a full, little plant that has a root, stem, and a couple of leaves. There are also enough nutrients in the seed for it to survive the first portion of its life. During germination, these vital nutrients (proteins, carbs, etc.) are transformed into glucose, which all plants need to for growth. 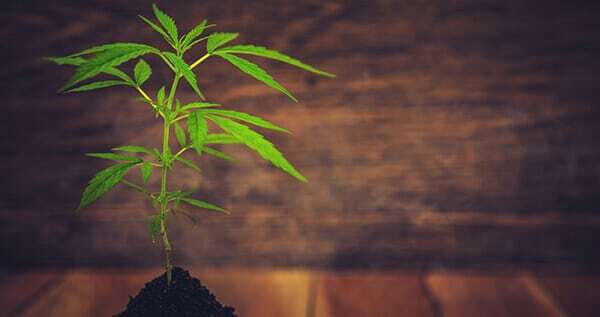 Learn how to grow strong marijuana plants ready for transplant. When seeds achieve a nice moistness level, they will enlarge and split open. A single root will grow downward with gravity out of that split. The root will always grow down no matter what and the stem will always grow up. Placing your seeds in water ensures that they have achieved the proper moisture level for the process of germination to begin. The seeds will not take on excess water and drown until about 2 weeks after they have cracked open (you will have already transplanted them into soil by then). When you fill your glass with water, simply put it in the living room so that it shifts to the temperature of the environment. Tap water is fine, but don’t give the seeds any extra nutrients because they already have everything they need. The seeds will crack open in between 2 and 7 days. Make sure to replenish the water in the glass every other day. Start transplanting when the roots reach 0.1 to 0.2 inches (3 to 5 mm) in length. Download my free marijuana grow guide to learn more about marijuana seeds at this link. The nutrient level of the seeds is already adequate, so you should use a soil with fewer nutrients to start. Soil made specifically for seedlings and clones that has low quantities of nutrients is ideal. Plants are very susceptible to nutrient burn at this stage if you give them too many nutrients. The pots should be filled halfway with the seedling soil. To make the half-inch hole, use your finger tip or a pen. Each seed should have its own pot. Since the roots will always grow down, you don’t have to worry how you place the seeds in the soil. Place the seed in the hole, and cover it up with the soil. When you spray the soil with water, it will tamp down on its own. Avoid pressing the soil. The germination process will continue until the plant starts to surface within a week. The taproot will produce other root offshoots so that the system is strong. Water is responsible for both life and germination, making it the most vital component early on. It is extremely important that you give the plants plenty of water and keep the soil moistened. Plants that don’t receive enough water will compensate by not growing to full capacity. This is largely to increase the plants’ chances of survival. Of course, too much water can cause the plants to lose out on valuable oxygen. Leaves will start to wither and the marijuana plant and growth medium will become more susceptible to diseases and bacteria. The soil needs to stay adequately moist (not too dry and not over-soaked). The seedling won’t use much water, but a lot of the water evaporates fast. This is the major reason why seedlings should never go on a windowsill or near a heater. Spraying the plants 1 or 2 times throughout the day should be plenty. Other than water, light is another vital component for the plant’s growth. Light and water help convert carbon dioxide into oxygen and glucose—necessary resources for plant growth. This is referred to as photosynthesis. When plants don’t receive adequate light, they will form fewer side branches and will elongate abnormally. This stretching helps marijuana plants grow taller to grab enough light in nature. Plants that receive adequate light will grow wider (not taller) and produce a flurry of side branches with a ton of buds. Light should be kept on 24 hours per day and the room should have a consistent temperature of around 72° Fahrenheit. The pots should be placed under a cool white CFL light at a distance of 2 inches. These tubes don’t create that much heat, they’re energy efficient, and they use the ideal light spectrum for seedlings. Seedlings require about 3 to 5 watts each. When the plants surface after 5 to 10 days, they will need all the light they can get to grow optimally. Creating the ideal climate is also important for germinating the marijuana seeds under ideal conditions. CFL tubes don’t produce that much heat, but they will keep the soil warm. You can keep the distance between the plants and the bulbs to a minimum, but if the temperature exceeds 77° F, then you should move them farther apart or cool down the area. Proper soil moisture is essential, but the soil only needs as much water as the seed can absorb (which isn’t much). Avoid adding more water or nutrients until the first true leaves emerge. This should occur after 5 to 8 days. In the meanwhile, be patient and simply monitor the moisture. As soon as the seedlings pop their heads out of the soil, it’s vital to inspect the distance between the plant and the light. Adjust the lights if the temperature goes past 72° Fahrenheit or the leaves start receiving excessive light. The soil also needs to stay moist. The leaves on the plants can absorb water, so continue spraying them 2 times per day. The plants need to grow and develop sturdy root systems. Big green leaves are capable of absorbing ample light and converting it into energy. Healthy root systems allow plants to take in plenty of water and nutrients. The plant is just starting to form the base for the remainder of its life, so it’s important that they receive proper, diligent care. When the initial internodes start to form, you can feed your plant with root-stimulating foliar nutrients. Start the plants off with a small dose as the developing roots can’t withstand higher concentrations just yet. The plants will start to grow rapidly (about 0.5 inches per day). Inspect your plants each day for signs of nutrient surplus (e.g. burned leaf tips). The roots will start to grow out of the bottom of your smaller pot at which point it’s time to transplant. The plant will become rootbound and stop growing if you do not transplant. To recognize the roots, look for white tips poking out of the bottom. Check for the roots each day and start giving your plants grow stimulator, which is high in nitrogen. More about nutrients on this link. If everything went as planned, then you have strong, healthy plants that will eventually produce high yields. A good start in life means that the plants will be less susceptible to bacteria, diseases, pests, and the effects of harsh weather extremes. Plants that are healthy can better absorb water and nutrients and will develop a faster metabolism for better yields. If you email me a photo of your seedlings, I will publish them on my site. These plants can now grow outdoors and will thrive in a wind-free location that gets a lot of sun. The plants will also do better in a big container (15 gallons) on a stool. This keeps away any interference from animals like rabbits or snails. As you have seen, it’s not very hard to grow healthy marijuana plants. If you want to start growing yourself, download my free marijuana grow bible and order some marijuana seeds. All top quality marijuana seeds are available in my marijuana seed shop. We ship seeds to the US, Australia and many other countries. For any grow related question please visit the marijuana support page. Shorter season varieties tend to have smaller seeds. I like to start them on a paper towel, and move them into soil once the taproot takes a direction, with the tap root pointing down. Go girl I'm with u all the way.Were riding on the same boat,stay in the wake. One thing I've learned in 65 years is Karma, You sow what you reap in this life! I see that this was posted year and a half ago, What is your status? Hoping that all is well. For sure , semantics have always been the best defense. just have a number of well concealed 1\2 oz stashes. When did Terry (your Governor) become a member of the GOP???????????????????????????????? You want the thermometer right where the plants are. That tells you what temperature the plants are getting. Mark, you could make a small aluminum foil tunnel (open for air flow) to hide the thermometer from the direct lights, and it would also be beneficial to have a room thermometer as well as the seedlings area monitoring. Awesome. Thanks for the advise. I thought being directly under the MH lamp was going to give me a false reading. Yes, I too have heard that playing classical music is very beneficial to the young plant-lings. Thanks for sharing that. If you start your autos after germ in 5-6 in Jiffy Pots (peat pots) when they're ready bury the whole thing. punch a few holes if it makes you feel better. Yeah if you want them to live, LOL!!! Does anyone have experience with the octo-pot hybrid growing system? Novice grower here! I have T5 grow lights for seedling starter. Can I use the T5 lights for putting my seeds under once they are planted in soil for getting them to root? Thanks! I used four T5 tubes for the entire grow cycle. My last plant was 22" tall and yielded 3oz of dried bud. I used Fox Farms nutrients. In other words, T5 fixtures can do the job from start to finish. I haven't done it with cannabis, but I have put fish heads or what's left over after filleting a fish in the bottom of a hole, add some dirt, plant whatever on top and whatever goes crazy. Hey Kansasjack, I think people on our forum would love to hear more about your techniques. The lower leaves are starting to fall off, any idea what could be causing this, the top of plant is fine with no sign of pests and disease. I have gotten seed from you guys before with the promise that I would get a FREE down lowed of you Bible on how to grow, I haven't got one yet.. So much for promises. David, There is no hard copy. You download the free grow bible as Roy has pointed out. Check your emails. I think there might be a link in the emails to your free copy of the grow bible. All plants don't all start as seeds what about clones? ? Dave; Once a clone is rooted, you grow it like any other plant, picking pup in early veg mode. I don't mess with the seeds, too much chance to screw them up. I plant them in soaked starter soil. They come up in about 4 or five days. Thanks for you comments; I will pass them along to the editor. Hi Robert, In one of the pictures you have has some plastic wrap, AM I supposed to do that? Lol Cannabis is the tree of knowledge, That must be why all the kids at the skate park are so swiched on. Lol Cannabis is the tree of knowledge, That must be why all the kids at the skate park are so switched on. Stephen Finch, I suggest you go here to our ILGM forum: support.ilovegrowingmarijuana...com Lot of great growers sharing grow knowledge. Never grown indica down here u.S. just want to make sure all is well 3 1/2 weeks.